Happy Holiday, friends! Today, we’re opening our doors to a guest. It’s my pleasure to introduce Gillian Marchenko. 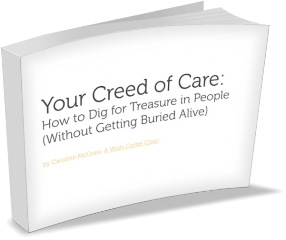 (Her tagline: “The world is full of people who seem to have it all together … Gillian speaks for the rest of us.”) She’s an author and national speaker who lives in Chicago with her husband Sergei and four daughters. Gillian writes about “stumbling faith, Down syndrome, adoption, depression, motherhood, and lots of grace.” I shared a guest post on Gillian’s blog earlier this year (“The Most Beautiful and Terrible of Promises, Lessons Learned from my Brother with Autism”), and I’m happy to bring her writing to you today. 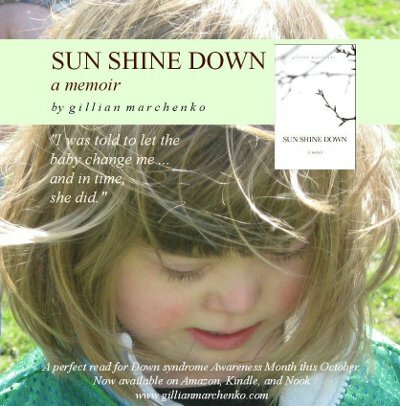 Gillian’s recently-published memoir, Sun Shine Down (T.S. Poetry Press, 2013) is a courageous, heartbreaking story about her journey to love and accept her daughter, Polly, who was born with Down syndrome. (You can read my Amazon review here.) Whenever I read Gillian’s words, I am able to see more clearly that love is the only thing that matters. “Mom!” Polly yells out in her sleep. Her body thrashes to and fro on our queen sized bed. Her legs kick the covers off. Sweat glistens her forehead. The house is quiet. My husband and two older girls went out for the night. My youngest has been asleep for an hour in her room. I bedded Polly in next to me, thinking that my husband would move her when he got home, and that her slight of breath, up and down, methodical, musical, may inspire me as I grab a few last minutes in the day to write with our fuzzy white dog at my feet. She doesn’t respond but continues to fuss and squirm. “Shh, there, there,” I attempt to settle her back into her dream cycle. This part isn’t new to me, a seasoned mother of four. There have been countless nights in the last twelve years where I’ve brushed wet hair off a forehead, hummed a melody, and lulled a child back to sleep. But my coaxing doesn’t work. My daughter nods, and a shot of electricity zaps my extremities. When Polly was born at 37 weeks, she wasn’t breathing. The doctors resuscitated her, and she spent the first three weeks of her life in an incubator fighting for her life. By the time I felt the weight of her tiny, five-pound body in my arms, I had already been informed of her diagnosis of Down syndrome. 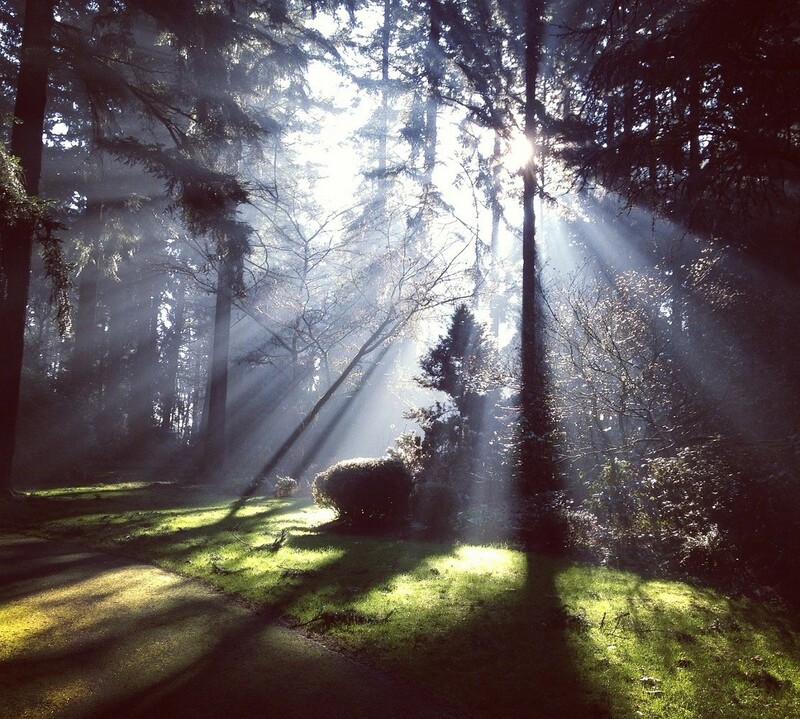 I wrote about that time in my recently published memoir Sun Shine Down. Polly too weak to leave her plastic dome and me, too weak to fathom the curve ball of Down syndrome. Sometimes my arms ache to hold Polly the baby. What I wouldn’t give to scoop her up, to hell with my fear of the unknown, to hell with sickness, and to hell with stigmas hidden within, stigmas I didn’t know existed in me until I heard the words Down syndrome. Polly gestures towards her head. She nods yes again. I pull her up onto my chest. It is not an easy task because she is now seven years old. But we don’t screw around with headaches in this family. Three years ago, Polly had a catastrophic stroke which resulted in the diagnosis of Moyamoya, a disease that thins the arteries in the brain to the point of strokes and seizures. Unbeknownst to us, this disastrous disease had been causing mild strokes in her body throughout her short little life. Polly underwent two brain surgeries that diminished the chances of recurrent strokes and seizures from 67% to 7%. She rocked the surgeries, actually running circles around me after the second one, just days after her neurosurgeon cut through skin, skull, and brain to create new blood flow for our girl. “Here, honey, let me see.” I force Polly’s face towards mine and examine her for signs of stroke. No twitching, no loss of motor control. The fearful moment releases into the air around us. I hold her to my heart like I longed to do after her birth. She settles, and sinks into me. My body is quicksand. I engulf her. We’ve danced around death too often. Polly is here tonight, in my arms. I don’t take it for granted. She’s here. I feel her weight. She is happy. She loves her life. Her life overflows with joy, so much so that she splashes her joy on those around her, and continually plugs up my heart, so that I can be filled too. What relationships teach you about acceptance? Join the conversation in the comments section below! It’s Tuesday afternoon, and I’m camped out in the guest room of my dear friends’ home. I’ve been traveling for two weeks, from an Alabama lake house to a Pittsburgh conference center and everywhere in between. There are plenty of stories to be told, but today, I’d like to share a short documentary with you. My hope is that you — fellow siblings and families — will see something of yourselves here. My hope is that you will be encouraged to show up for one another, to show up for your life. The film is entitled My Brother. It’s just over 14 minutes long, and it’s about the process of finding meaning and beauty within challenging relationships. If that’s not sufficient motivation: I sport several completely embarrassing outfits and hairstyles along the way. There really are hula skirts. Enough said. What did you think of the film? Join the conversation in the comments!